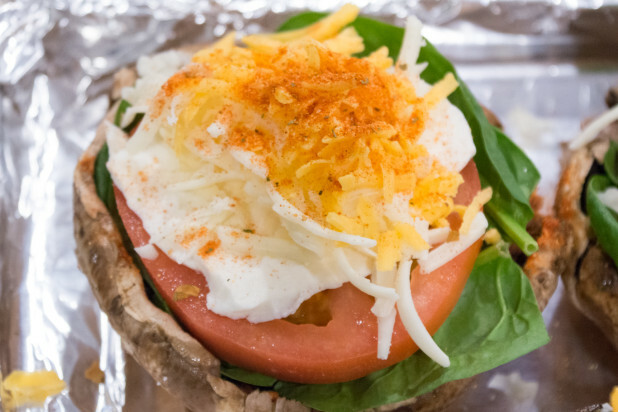 This recipe is inspired by a trip I took to Wegmans grocery store. If you haven’t heard of it, Wegmans is a huge high end grocery store chain that is known for its massive prepared food section. 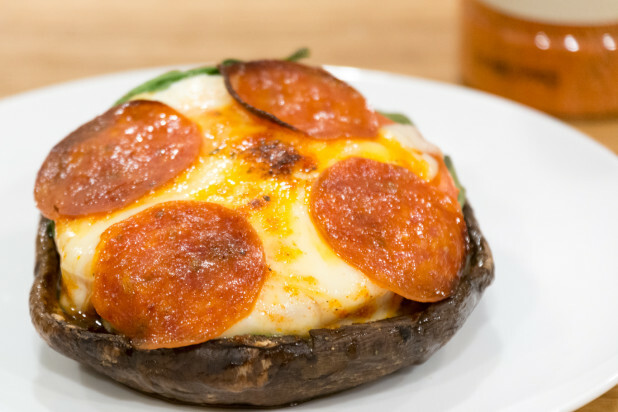 I was surprised to find a wide variety of premade keto foods and one of them was Portobello pizzas. I instantly thought, “Hey, I could make that!” and off I went. These are super simple and can be customized with different toppings to your individual liking. As a bonus, I just got my new FlavorGod pizza seasoning and this was a perfect opportunity to try it out! 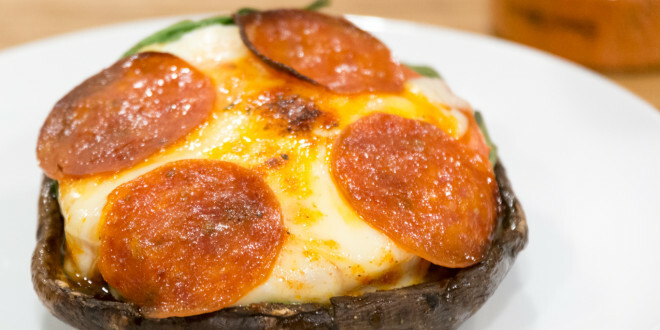 This recipe starts with large, Portobello mushrooms. Wash them off and then cut the stem as low as you can as shown on the left. Next, slice up a tomato. 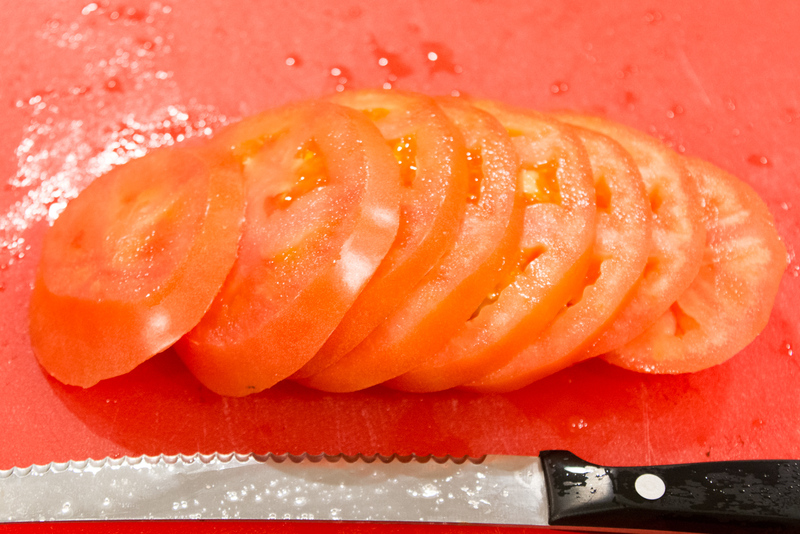 Protip: To slice tomatoes, its much easier if you use a sharp, serrated knife. 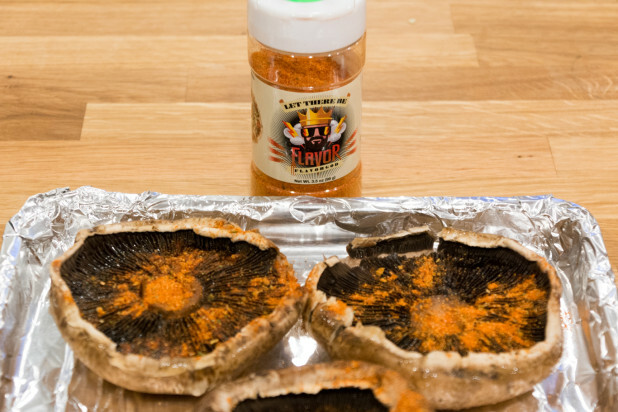 After the ingredients are prepped, its time to deal with the mushrooms. 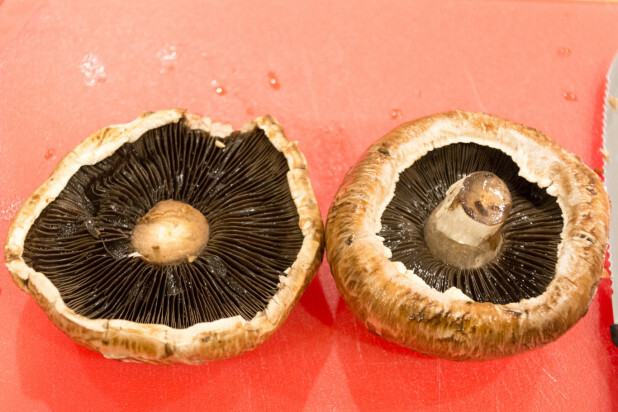 Drizzle the Portobellos with some olive oil and then season. 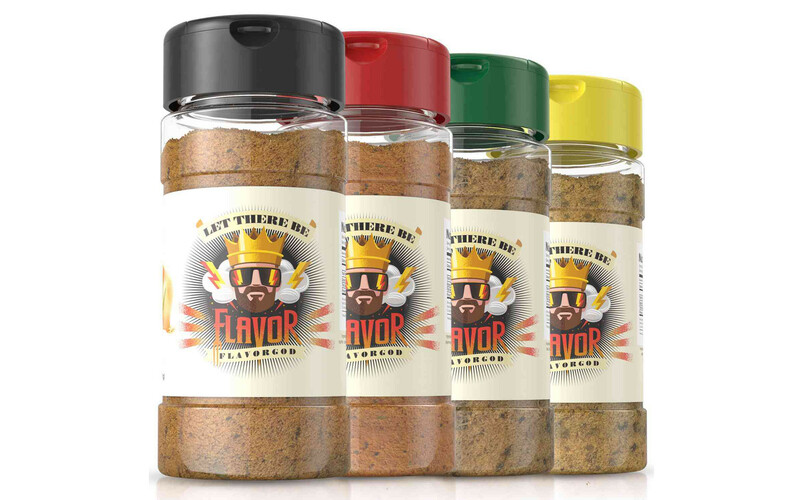 I got this great new Pizza seasoning from FlavorGod that I’ve been meaning to try out. 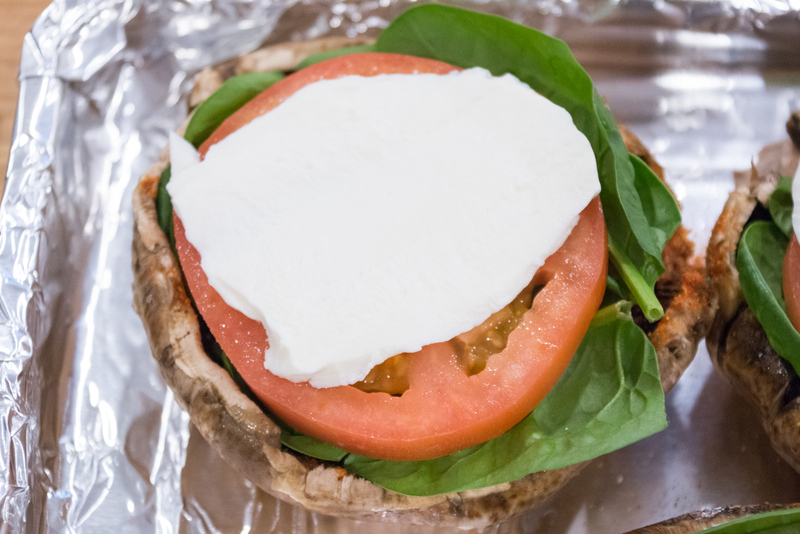 As I said in the start, you can top your pizza with whatever fits you fancy but I choose to start with some spinach, tomato and Mozzarella. I added some Monterey Jack, Cheddar and another dash of FlavorGod Pizza seasoning. These are now all set for the oven! I ended up using my tabletop convection oven since this all fit on a small pan. 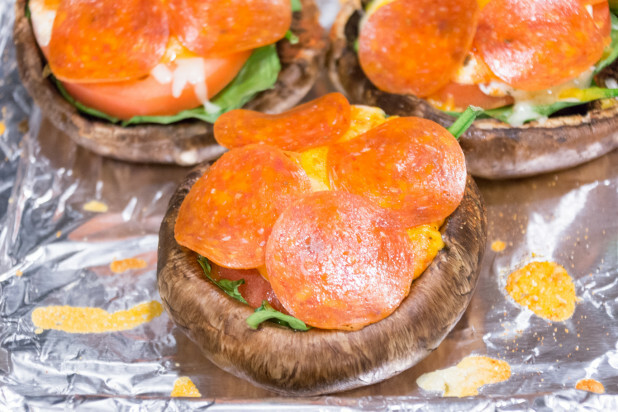 The cooking time will vary but you’re just looking to melt all the ingredients and soften the mushroom. I added the pepperoni half way through the cooking process so it would fit on top of the mountain of cheese 🙂 Mmmm, here’s a shot of the gooey cheese and crispy pepperoni as the Portobello Pizzas come out of the oven! And done! Here’s the finished Portobello Pizza! If you’ve been cutting your tomatoes with a regular knife, you’ve been doing it wrong! 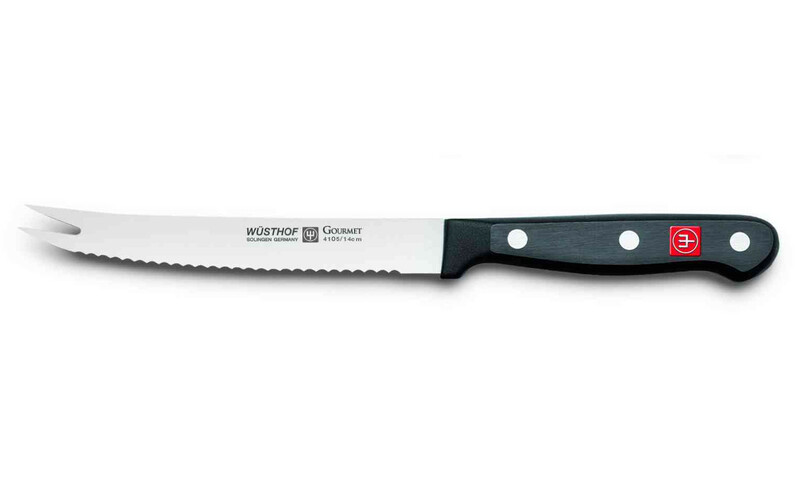 This baby has super sharp surrated blades that slice up a tomato with ease. An added bonus is the two pronged spears on the end of the knife for picking up the slices when you’re done! Hi! 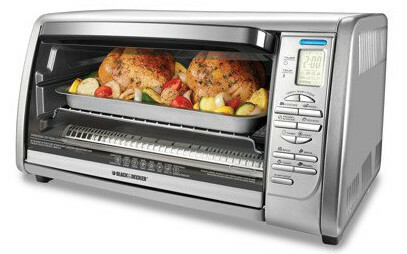 I’m new when it comes to meal preparations, and I have a rather silly question, 450 degrees celsius or fahrenheit? I doubt they reheat well. 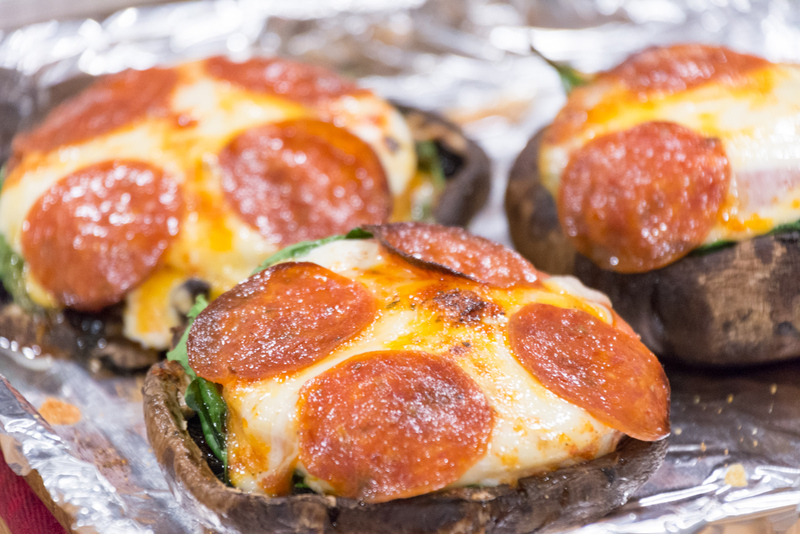 Portobellos (in my opinion) get squishy when you reheat them…. For your nutrition calculations, do you already have this converted to net carbs, or no? Any idea about a sauce for this? I can’t imagine pizza without a sauce.